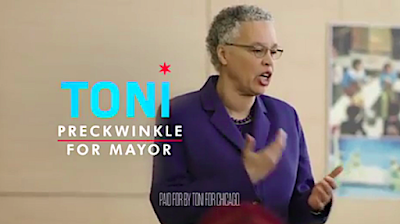 ■ The Tribune’s Eric Zorn: Five key differences between Preckwinkle and Lori Lightfoot. ■ Zorn’s colleague, John Kass: Anti-gay political flyers targeting Lightfoot may help her campaign more than they hurt it. ■ Get ready to cast your ballot—in Chicago and the suburbs. Check the updated Chicago Public Square voter guide. ■ Hear his lecture yesterday as a City Club of Chicago podcast. ■ Six Chicago cops committed suicide over the course of eight months. ■ The city’s pumping $32 million into 32 schools to expand advanced educational programs. Electoral College #TimesUp? A University of Texas law prof details the pros and cons of Sen. Elizabeth Warren’s proposal to overhaul presidential election law. ‘Potentially dangerous.’ Washington Post media columnist Margaret Sullivan warns journalists against “premature judgments” regarding front-runners in the Democrats’ crowded race for president—especially coverage that portrays victory as inevitable for one of “the B-Boys”: Beto, Biden and Bernie. ■ NBC News: A liberal push among Democrats is fundamentally changing the nature of campaign management. Boeing close call. A day before a Boeing 737 Max 8 crashed into the sea off Jakarta, killing 189 people, an off-duty pilot averted a similar fate for another Max 8. ■ Cockpit recordings from the doomed jet reveal pilots’ frantic struggle for control. 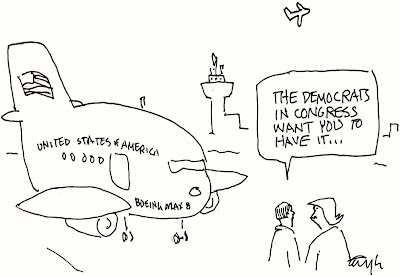 ■ U.S. airlines tell The Wall Street Journal why they kept flying Max jets when others around the world grounded them. ■ Chicago-based Boeing’s recently well-rewarded CEO is apologizing in full-page newspaper ads. ■ Meanwhile, the president overnight tweeted out years-old conspiracy-theory crap about the Transportation Security Administration. ■ ProPublica Illinois: The UIC acknowledges it missed warning signs that a prominent child psychiatrist was violating research protocols and putting kids with bipolar disorder at risk. ■ Chicago actors turned out yesterday to support Chicago Symphony Orchestra musicians on strike. Supermoonstruck. If skies are clear (and they probably won’t be), tonight around 8:42 will be an optimal time in Chicago to see 2019’s “third, last and best” full moon at perigee (its closest monthly approach to Earth): A Super Worm Equinox Moon. A Chicago Public Square advertiser. Thanks … to readers Mike Braden and Mark Wukas for typographical refinements noted above in red.